Group Policy has an important and often under-appreciated job in most organizations. It’s responsible for securing and locking down Windows servers and desktops across enterprise. Yet many Group Policy deployments were rolled out piecemeal, over years, without proper controls or mechanisms in place to ensure a modern, reliable infrastructure. Given today’s security threats, that’s no longer a wise strategy for managing your Windows infrastructure. 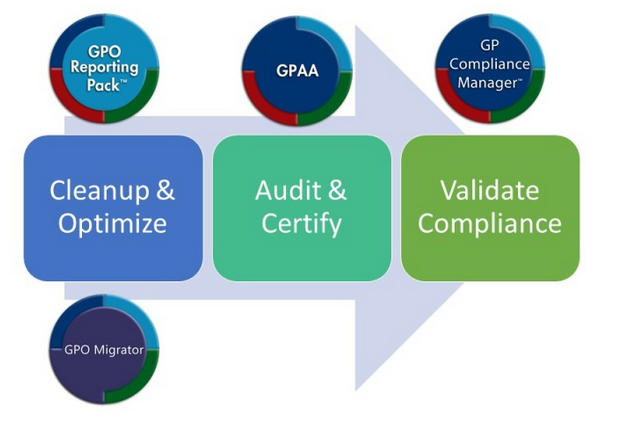 Through our partner SDM Software, we provide the solutions to help you modernize your Group Policy deployments – from assessment to migration to control – in the form of auditing, certification and compliance of Group Policy settings: the full life-cycle of a “Modernized” Group Policy deployment. It all starts with a proper assessment and clean-up of your GPOs! SDM Software is uniquely positioned to help with this problem, providing their GPO Reporting Pak and GPO Migrator products to help you find duplicate, conflicting and unused GPOs and settings, and clean them up or optimize them. Whether you’re doing an Active Directory domain migration or consolidation or just looking to clean-up and consolidate Group Policy, we will help you get there in record time! The reporting and analysis tool that provides unique insight into how you are using Group Policy today, and how you can clean it up for tomorrow. Simplify the process of cleaning up, consolidating and reorganizing your Group Policy environment. Pick settings out of GPOs and move them to other GPOs as needed. The GPO Migrator supports migration of GPO settings to DSC documents, to ease the transition to DSC. Real-time Group Policy change auditing, alerting, GPO rollback and GPO attestation/certification to maintain visibility over your GPOs and prevent “GPO Sprawl”. The only GPO “SDK” that allows for automated GPO change management via PowerShell. Group Policy-as-code is now a reality! Provides the feedback mechanism missing in native tools to tell you that Group Policy has been successfully deployed and allows you to validate that critical security hardening has been received by your Windows servers and desktops.